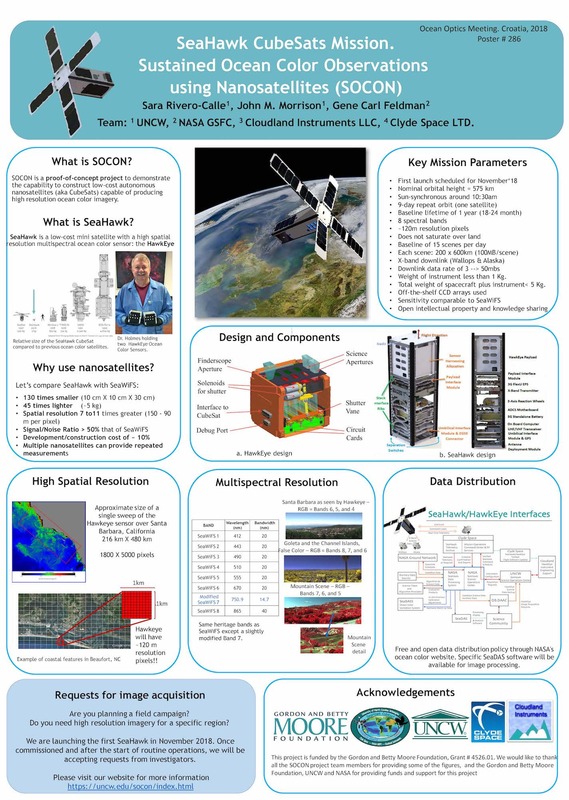 Hazel Jeffrey, Hessel Gorter, Alasdair Gow, Craig Clark, Alan Holmes, Craig Herrin, Linda Sasaki, John Morrison (2015) SEAHAWK: A Nanosatellite Mission for Sustained Ocean Observation. British Interplanetary Society, Proceedings of 13th Reinventing Space Conference. 9-13 November 2015, Oxford, BIS-RS-2015-50. (Presentation and Paper). John M. Morrison, Alan Holmes, Hessel Gorter, Hazel Jeffrey, Gene C. Feldman, Pamela Anderson, Craig Clark, Frederick S. Patt (2016) SeaHawk: An advanced CubeSat mission for sustained ocean colour monitoring, SPIE Remote Sensing, 26/9/16, Edinburgh, UK, Ses 10, 47. John Morrison, Alan Holmes, Hessel Goter, Martin McGahon, Peter JW Anderson, Gene Feldman, Frederick Patt, 2017. SOCON - SUSTAINED OCEAN COLOR OBSERVATIONS USING NANOSATELLITES, Reinventing Space Conference Proceedings, BIS-RS-2015-53, 6 pages. Holmes, Morrison, Feldman, Patt. 2017. Hawkeye Ocean Color Instrument – Performance Summary, Proceedings AMS Annual Meeting, Austin, Tx. J32.3, 16 pages. Morrison, Holmes, Goter, Jeffrey, Feldman, Anderson, Clark, Patt, 2016. SeaHawk: An advanced CubeSat mission for sustained ocean colour monitoring. Proceeding of SPIE, Vol. 96998, September 2016. Alan Holmes, J. M. Morrison, G. Feldman, and F. Patt, 2018. HawkEye Ocean Color Instrument – Performance Summary (Invited Presentation), AMS Annual Meeting, Austin, Tx, Paper J32.3. John Morrison and Sara Rivero-Calle, gave the keynote speaker presentations for the 2019 Blue Heron Bowl: "Ocean Observations” and "Satellite Observations of the Ocean: SeaHawk CubeSat" at NC Aquarium at Fort Fisher on February 1st, 2019. 20161021- NASA RideShare Program, NASA Goddard, Greenbelt, MD.